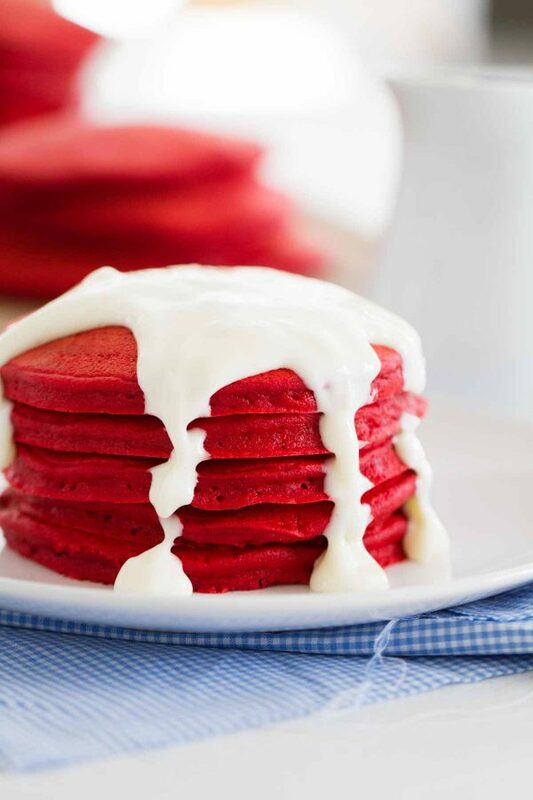 What better way to wake up than with a big stack of these Red Velvet Pancakes with Cream Cheese Drizzle? Whether for a holiday or a special treat, these red velvet pancakes are light and fluffy and quick to whip up. For those of you that have been with me for awhile, you know that I’ve got a little red velvet obsession. In fact, I even wrote a whole book about it. And in years past, I’ve done full weeks dedicated to it. In a large bowl, whisk together the flour, sugar, baking powder, cocoa powder and salt. In another bowl, whisk together the milk, egg yolks, vegetable oil and food coloring. Stir the wet ingredients into the dry ingredients just until moistened. The batter will still have some lumps. In another bowl, beat the egg whites until stiff peaks form. Stir one-third of the egg whites into the pancake batter to lighten it. Then fold the remaining egg whites into the batter gently but thoroughly. Heat a large griddle over medium heat. Spray with nonstick cooking spray or brush melted butter over the griddle. For each pancake, pour 1/3 cup of the batter onto the hot griddle. Cook until the surface of the pancake starts to bubble and the edges dry out, then flip and cook the second side. Put the pancakes not a baking sheet and place the sheet in the oven to keep warm while you cook the remaining batter. Beat the cream cheese, powdered sugar, vanilla and salt in a bowl. Beat in enough of the milk to make a pourable consistency. Serve the pancakes topped with the cream cheese drizzle. 0 Response to "RED VELVET PANCAKES WITH CREAM CHEESE DRIZZLE"